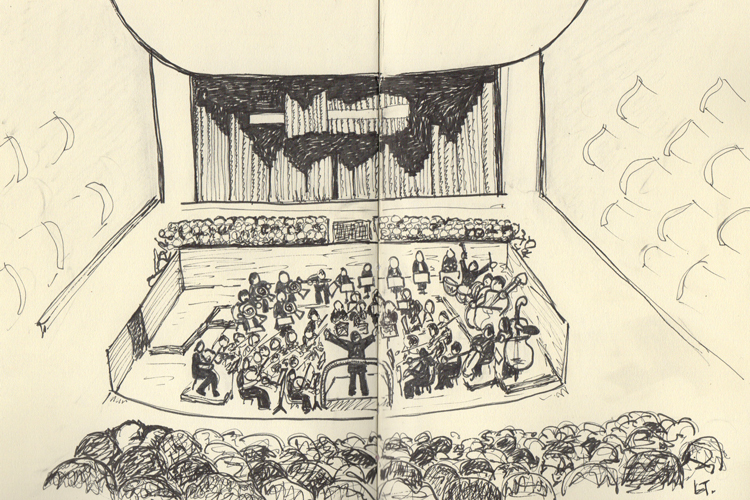 The Aurora Orchestra, conducted by Nicholas Collon. Royal Festival Hall, Southbank, London. First half pieces & text by Olivier Messiaen, Kate Wakeling, Brett Dean, György Ligeti. The first half of the performance ended with the musicians placing ticking metronomes on the edge of the stage, kneeling next to them and making origami cranes. The audience were invited to add their own cranes during the interval. The second half was Beethoven’s 6th Symphony, The Pastoral. The orchestra stood, playing the whole symphony from memory, surrounded by paper cranes and fairy lights, some parts of the symphony were played in the dark, with the musicians wearing illuminated paper cranes on their wrists. Because the musicians were playing from memory they were able to move around and change positions. In the second movement the strings moved back and the woodwind came to the front, which absolutely changed the perception of the piece. The bird songs between the flute and oboe became far more prominent and alive. The encore was a repeat of a part of the Pastoral, but with the orchestra spread out amongst the audience, so that the we were surrounded by the music.